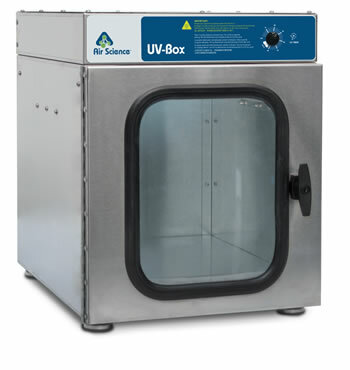 The Air Science® UV-Box™ is a high-efficiency chamber designed to safely decontaminate contents while providing a safe work environment for the operator. 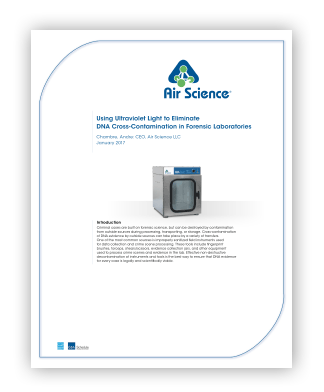 High intensity UV lamps are positioned within the cabinet producing short wave ultraviolet light at 254nm to destroy exposed surface DNA and bacteria, leaving evidence free of contamination prior to other forensic tests, analysis or procedures. UV lamps are optimally placed to eliminate blind spots and corners and walls are smooth to ensure easy cleaning. Stainless steel surfaces naturally reflect UV radiation to ensure contents are fully irradiated from all directions. Professional design and construction features offer convenience and protect the safety of personnel during use, cleaning and maintenance of the cabinets. The operator is protected from UV radiation by the UV absorbing window and with safety controls to ensure that lamps cannot be activated until the cabinet door is securely closed. 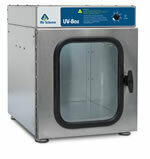 Other safety features include UV timer, hanging rod and shelf to support or suspend items for decontamination. A. 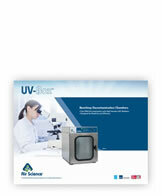 254nm UV lamps will destroy all exposed DNA and bacteria on items within the chamber. 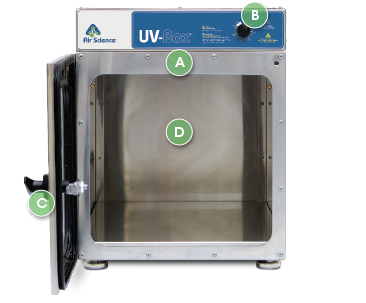 B. UV timer allows user to set specific decontamination time and cycle. C. Key locked, UV absorbing, transparent window with safety interlock. D. Smooth internal stainless steel walls for easy cleaning and sterilization.